Putting a little bit of effort into where you live really does go a long way. Keeping a nice home doesn’t need to cost a lot of money, but you do need to put some effort into it. Adding decorations to the front of your house is an easy way to brighten your home from the very first moment anyone enters. Wreaths can be made or bought for any season or holiday you can think of, and you can keep them to reuse for many years, allowing you to save time and energy getting new decorations. If you’re looking for a more creative approach to the traditional wreath, try making a star- or snowflake-shaped wreath! 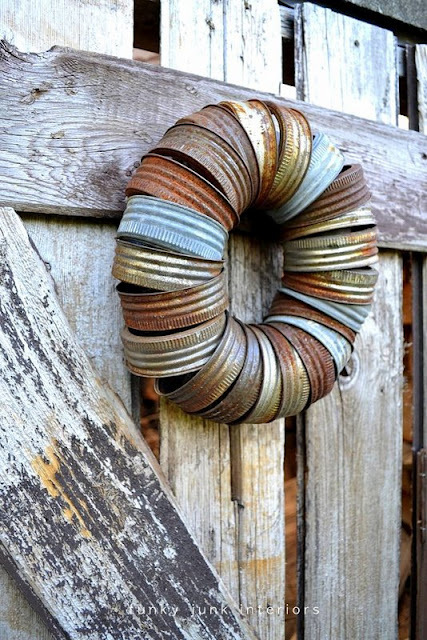 Thinking out side of the box is a great way to increase the visual appeal of a wreath. Making a balloon wreath with different colours of unused balloons is the perfect low-key decoration to mark the location of a birthday party! Flowers are a classic choice to bring a bit of excitement to your front living space! The best choice is to use fresh flowers from your garden or a local market so you can change them each week. If that’s too much upkeep for you, get a nice bouquet of silk flowers or- better yet- a few different ones to change with the season! Start collecting Mason jar lids – you can look for used ones at vintage stores and flea markets, or can find new ones at superstores like Walmart or Target. When you have enough, link them all together with a piece of string. Tie them together fairly tightly and – ta da! – you have yourself a beautiful homemade focal piece for your front door. You can find these lids in all sizes (for added effect) or paint them to accentuate the colours of your home. Finally, plants are a sure-fire way to bump a front door area up to the next level. Use hanging baskets and boxes to plant bright flowers like daffodils and lilies in the springtime, or sunflowers and daisies in the summer. Autumn is the perfect time for a display of corn, gourds, and apples, whereas winter lends itself more to holly, pine, and rich spices. Find yourself something small to add to your front door and you’ll be amazed at the change it makes in your home energy!